In a lecture at Bangor University on 2 November 2017, Sean Cunningham talked about the brief but influential life of Arthur Tudor, older brother of Henry VIII and the man who should have been king. Arthur Tudor is an often overlooked figure in the history of the English monarchy, but, in his recent lecture at Bangor University, Sean Cunningham brought the young Tudor to the fore and spoke engagingly on Arthur’s place in the Tudor dynasty. A recurring theme throughout Cunningham’s talk was the influence Arthur’s memory on his younger brother, Henry. After all, Arthur was the first Tudor successor, not Henry. And it was Arthur who was trained to be king, not Henry. The switch over, emphasised Cunningham, was a difficult one; it was ‘a story of investment and then cataclysm’. Henry VII, the first Tudor king who defeated Richard III at the Battle of Bosworth Field, invested everything in Arthur and his hopes for him. It was a tenuous position that Henry VII found himself in when he became king, as many others had a better claim to the throne. Thus Henry had to act fast to accomplish several steps: he needed to marry and secure Yorkist followers, which he accomplished by marrying Elizabeth of York, daughter of King Edward IV, and he then needed an heir ASAP. When Elizabeth became pregnant, Henry engaged in a sort of ‘dynastic propaganda’, planning an elaborate birth ceremony. (Of course, all of this was contingent on Arthur being a boy, the result of which Henry was fortunate in.) The importance which already rested on the unborn child’s shoulders is evident in the choice of name. Arthur would already have had a role model to live up to; the ‘legend had to merge with reality’. Thomas Malory’s Le Morte d’Arthur, published in 1485, was becoming popular, so the subject of the mythical King Arthur would have been freshly revived in the public consciousness. To further emphasise the connection, the christening was to be held in Winchester, one of the alleged sites of Camelot. All this served to broadcast a message of unity around the birth of this ‘once and future king’. Arthur was born eight months after the wedding of Henry VII and Elizabeth of York, probably prematurely. This was not an auspicious beginning. Henry was already dealing with the claims of various pretenders to the throne popping up – men claiming to be Edward V or Richard, Duke of York, the young princes who had disappeared in the Tower of London under the watch of Richard III. The newborn Arthur was meant to bind people to the new crown; he was going to unify the country in a way that Henry alone could not. Less than one month after his birth, Arthur was sent to live in Farnham Palace in Surrey while his parents went back to live in Greenwich. Farnham was isolated but defendable and, critically, away from the unstable life at court. The young prince was left in the care of a Yorkist household who had also helped to raise the queen. Farnham began ‘to take on the shape of a mini royal household’. Arthur soon began to be taught all the essential skills of a young medieval nobleman. Records show that he received a gift of a bow and arrow, and he was also learning to ride and to fight. At age six, Arthur moved to Ludlow Castle, on the border between England and Wales, where he was meant to stay until he was ready to take the throne. Henry’s placement of Arthur in Ludlow was a strategic move to strengthen his ties to the Welsh nobles. In 1489 Arthur was made Prince of Wales in Westminster, at which ceremony he was already riding on his own and speaking to the crowds. Later, in 1493, Arthur entered the Welsh Marches supported by a delegation of prominent nobles and allies. He was in the process of moving from being a juvenile to training to be a leader (training which Henry VII had been denied as a young man). In this effort, it was essential that he was supported by powerful Welsh allies and marcher lords, such as Richard Croft, Jasper Tudor, and William Stanley. With the help of these men, Arthur assembled one of the largest military forces in the kingdom as a mere child. 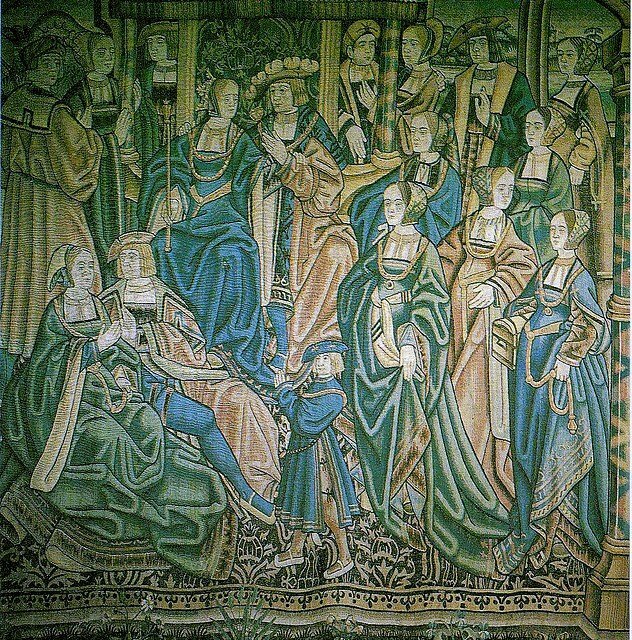 Tapestry (c. early 1500s) depicting the court of Katherine of Aragon and Arthur Tudor. The next essential step in Arthur’s path to kingship was the arrangment of a beneficial marriage. Henry VII began negotiating with Catholic monarchs Ferdinand and Isabella of Spain as soon as Arthur was born over the potential union of his son and their daughter, Katherine. The potential marriage was agreed when the pair were only three and four years old. In 1499, it was made final through a marriage by proxy. It was not until 1501, however, that Katherine left Spain for England. Elaborate pageants and celebrations were planned to welcome the princess into London, all of which were themed to emphasise the connections between the two countries. However, Katherine was blown into Plymouth instead, which meant that, when she finally reached London, all the scheduled festivities had to be rushed through. Still, this wedding was a significant event for Arthur. It was a chance for the young prince to be centrally positioned in the view of his subjects, since he had been hidden away in various country estates for most of his short life. Katherine and Arthur were two teenagers who had both been trained to rule and were used to public life. They were, in many ways, a very good match. By all accounts, Arthur couldn’t believe his luck when he finally met Katherine, who was a powerful and beautiful young woman. The two lived together as husband and wife for five months at Ludlow – what would become the time of the ‘great speculation’ over whether or not the marriage was consummated. Then Arthur died suddenly, probably of sweating sickness, which was epidemic at the time. With him died all of Henry VII’s careful plans and grand ambitions. 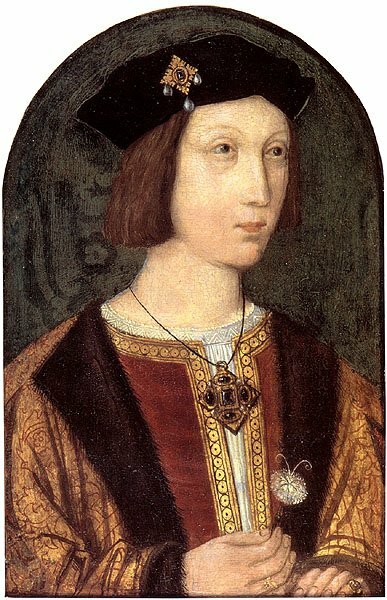 Arthur Tudor’s biggest legacy is probably his influence (direct and indirect) on his younger brother, the future Henry VIII. The two barely met in life, although a young Henry led the dancing at Arthur and Katherine’s wedding, where he was reportedly already very charming and charismatic. Indeed, this was to be the new king-to-be’s primary approach in his own reign, as he had not received the extensive training in administration and ruling that his brother had. He was already obsessed with jousting and was much more comfortable with the showy, decadent side of court life than the intricacies of ruling. Henry VII’s wife, Elizabeth of York, died shortly after her oldest son following complications from childbirth at 37. (The child, a girl, also died.) The two Henrys were now left alone together, and Henry VII was faced with the prospect of starting all over with his second son. Things got ‘quite chaotic’ at this time, as Cunningham put it. The young Henry did not get along well with his father, and he was always pushing for more power. Henry VII, who was himself in ill health, could see his end approaching and knew that he had a limited time to train Henry for what was to come. For Henry VIII, Arthur was a constant point of reference and a reminder of what might have been. Henry was left to be second in everything: second son, second Prince of Wales, second husband of Katherine of Aragon. Henry was also left with a lifelong fear of contagious diseases, which was probably due to his brother’s sudden death. So, while ‘we remember Henry VIII because he lived’, Henry probably spent a large part of his own life remembering his brother, Arthur, whose death was almost the end of the Tudor regime. Dr Cunningham is Head of Medieval Records at the National Archives, Kew, and is the author of the recent book, Prince Arthur: The Tudor King Who Never Was. Read an extract here.